The hanging of Saddam Hussain & the madness after – I say. Essay. Assay. ऐसे. I had once mentioned what kind of video clips make it to the viral-able grade. That was in the context of sports events/incidents. I also believe the days of ‘World’s Most Amazing Videos‘ genre of programming are over on TV. YouTube and other video-sharing sites completely own this genre now. Similarly, while ‘breaking news’ is still most dramatic on TV, the reference / search and archival possibilties ensure a much longer life for these videos on the Internet. There is a popular post which compiled a list of the top ‘Viral video moments of 2006‘. 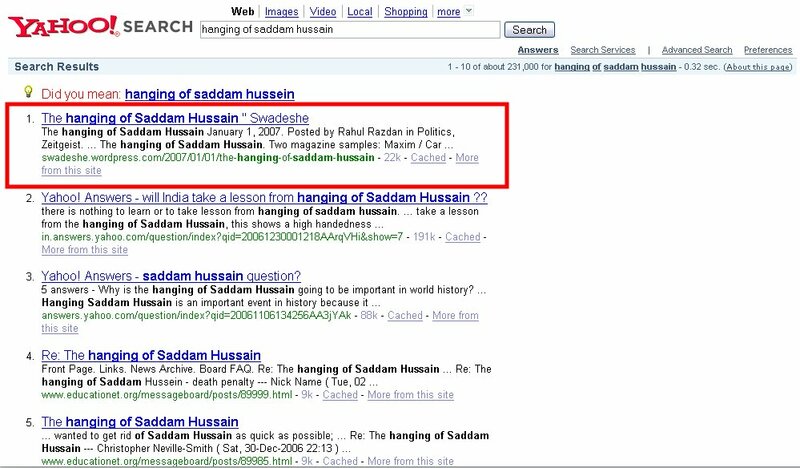 However even as that list was doing the rounds — the biggest such event happened — the hanging of Saddam Hussain. It was against this backdrop, and being a faithfully-in-love-with-the Internet person, that I was checking out YouTube on the morning of January 1. And that’s when I made the observation about 18 17 of the top 20 ‘most viewed’ YouTube videos on that day being of Saddam Hussain’s hanging. Somehow I wasn’t comfortable linking the actual videos here. And then two days later when I logged in to my WordPress dashboard I did a double-take with disbelief! My daily visit count was just going through the roof. The previous best ever was 348, the day Amit Agarwal had tipped DesiPundit about the Maxim magazine post of mine. I wanted to write this post two days back, but was waiting for the deluge to ebb a little. Sadly, I still don’t have a point of view on this issue yet. Incidentally there was no visible increase in the list of spam messages, thus proving that the sheer magnitude of organic activities far out-strips the dogged efforts by spammers!